Paris Conference: We Will Neither Forgive nor Forget! What insulting painful games are not played with our suffering nation. This time, it is the performance of the agonizing drama of the Paris Conference, with the endorsement and support of the US, which has gathered the enemies from the Northern Alliance, Taliban, Gulbuddin’s party, Al-Qaeda, the United Front, the Afghan High Peace Council, the National Coalition, the Truth and Justice Party, and others, to bring ‘peace’ for our people. Basically, it is not painful why these gangs of professional killers, with their mouths filled with blood, are sitting around a table and talking about ‘peace’; nor is it the fact that suppose these treacherous murderers reach an ‘agreement’ for creating a joint government, and butcher our people, together with a comfort they never had before; the actual issue is that the propaganda machine of the US occupiers and its allies have all created such hue and cry through their ‘experts’, ‘analysts’, and pet bondservants like Zarif Nazar from Radio Azadi (RFE/RL Dari), Dr. Akbar Wardak, Dr. Ahmad Mahjoor, Wahid Muzhda, and others, who call the Paris Conference an ‘event’ and talk about it with such enthusiasm as if the people of Afghanistan have only this choice, and if they want peace they have to submit themselves to these murderers, for they are the undoubted ‘leaders’ of Afghanistan, a group of whom is in power, the other is the ‘respected armed opposition’, another is the ‘respected unarmed opposition’ of the Northern Alliance, and with their conciliation there will be peace and stability in Afghanistan! But they have stupidly misperceived our people to be as senseless as they are traitorous and corrupt. Peace is only attainable through the prosecution and punishment of these criminals and national traitors. By sacrificing justice, our people will never see peace. Our people very well know these people who swore by the Quran and broke their vows, who are the worst traitors who brought tribal, religious and lingual conflicts, were the first importers of the Osama bin Laden virus and their Arab brokers. They also don’t believe that they will last long without biting each other’s heads off, and that too at the cost of our people’s sufferings. For as much as they have been beefed up with the embezzlement of billions of dollars, their desire for peace and ending their crimes has diminished. These gangs have committed the most heinous treacheries and crimes and are worried about the future when they might be tried in field courts and hung by our people. This is why they pass impunity laws for themselves, with a shamelessness never seen before. They are ready to accept any indignity for remaining in power, and are not even inclined to divide it because they find it without taste if they don’t have a monopoly in power, fearing they would be beaten by this or that rival. Although their fag end is mainly in the hands of the US, but they are one of those loose people, who are not content with one customer, and are busy courting the cruel Iran, Pakistan, Saudi Arabia, Turkey and other countries. The relationship between these traitors, who have earned mythical fortunes by servitude to foreign governments, smuggling of drugs and ancient artifacts, and looting of public wealth, is mainly based on ripping each other apart, not getting along, especially until our people’s clamorous uprisings has not sent tremors down them. Before they could be punished by our people, a considerable number of these people, who belong to different mafia groups, have been killed by their ‘brothers’ over disputes related to splitting spoils and privileges. Their presence in the government is not only a fundamental barrier in securing peace, it has been ringing alarm bells of the disintegration of Afghanistan for a while now. Disturbingly enough for our people. This matter was brought up again recently, by arch-criminals Zia Massoud, Mohaqiq, Atta Mohammad, Dostum, Latif Pidram and others, with the support of their American godfather Senator Dana Rohrabacher. Till today, it was the despotism of the Jehadis and their associates that drove our people towards the medieval ages, but now it’s the imperialist US that wants to add the ruthless Taliban in its puppet regime, so that our country goes in that direction quicker, harder. This deceitful ‘peace’ is a necessity for the US, not for the deprived people of Afghanistan. Not eliminating the US’s chained dogs, but promoting ‘peace’ between them is clearly and simply treachery against our people. We hope for peace which is based on the independence of Afghanistan from the captivity of the US, the arrest, prosecution and punishment of traitorous brutes, accountability for the billions of dollars from each of them and their affiliates. Otherwise, our people will not see a ray of peace, democracy, progress or prosperity. For the US it is important that with Afghanistan in its claws, it can build its military-espionage bases next to China, Russia and India; and have under its control our massive energy resources and heroin smuggling of the area, in addition to our huge mines. The only thing that does not matter to this aggressor and bullying force is the nature of the governing force in Afghanistan, even if it is far worse than the reactionary and bloodthirsty regimes of Iran and Saudi Arabia, in butchery, inhumanity, being anti-democrat and misogyny. Jehadi and Talib gangs’ lives are dependent on growing and smuggling drugs, and this is the vital common ‘economic’ tie between them and the US government. It is for this reason that neither does the US ever bombard the areas growing opium, heroin refinery centers and stores of hashish and heroin, nor does the infamous Karzai regime, which makes claim of having ‘confiscated’ hundreds of tons of hashish and heroin from trucks and stores from time to time to deceive our people, ever gives news of the arrest of the owners of even one of these trucks or stores. The bootlickers of the Jehadi and Talib murderers and the US, who propagate for its presence in our country, might say that each party has evildoers and this has no connection with the fundamentalist ‘leaders’ and the US. But even our children will ask which one of these arch criminals, dead or alive, have hung or jailed one of its butcher thugs. Would Nadia Anjuman’s coward husband dared to kill her if there hadn’t been a license to kill from the slaughterer Ismail Khan and his associates, or had there been a law and accountability in this country infected with fundamentalist bacteria? Had Jaihoon not had the backing of the criminal ‘Martial’, would he have committed that atrocity? Helpless women like Amina, Sanobar, Anisa, Zakia and others, and more recently Shakila – a teenage girl in Bamyan who was raped and killed by Wahidi Beheshti, one of the vicious Jehadis – and hundreds of other examples show that with the existence of bloodsucking fundamentalists backed by the US, this disaster has no end. Who doesn’t know that a ruthless murderer named Hakim Shujayee is supported by warlord Karim Khalili and the US? If these two had had a shred of conscience and nobility, they would not have considered conferring with a handful of killers, not because they killed countless revolutionary and honorable intellectuals in Pakistan and Afghanistan, not because they plundered Kabul, and killed and dishonored tens and thousands, but only because they spray acid on the faces of schoolgirls, cut off noses and ears of women, because of the killings of Zarminas and Safia Ama Jans. They should have cursed the participants of the conference and seen them worthy of being hung in gallows, so they would have earned the admiration of the Afghan nation after being expelled from the conference. They should have told Zia Massoud and Qanouni that by wearing ties, they cannot change their stone-age characters or hide the stains of blood or holes of being CIA and ISI agents, like Hakim Mujahid, Motawakil and Ghairat Baheer cannot, with their ridiculous English-speaking. These two women who were decoration pieces in the conference, have forever returned with their faces blackened in front of our pained people, for when they met Hanif Atmar and Olomi, the killing of freedom fighters under torture in the Polygons of Pul-e-Charkhi and the list of 13,000 killed, didn’t materialize in front of their cold filthy eyes. They didn’t tell them that yesterday you abominable people bowed your head before Kremlin and today proudly parade the leash of servitude of the CIA and other fundamentalists around your neck, so how and by what right do you talk of peace? Instead of spitting on the faces of the filthy participants of the conference, they were exultant and talked good and heard good with ‘brothers’, in a ‘very friendly and productive and sociable atmosphere’ (torturer Hanif Atmar) without a trace of consciousness, and insulted our martyrs in an unforgettable fashion. It is here that we shout out to Farkhunda and Nilofar and others like them: are you waiting to be dishonored by these ‘respected’ Jehadi and Talib gangs, or have your daughter and son dishonored by them, and maybe only then you will frown a little and say you have ‘issues’ with the ‘religious brothers’? Mercenary ‘experts’ are trying to make this conference look like a ‘serious and important’ turn of events, with every possible American-friendly argument. 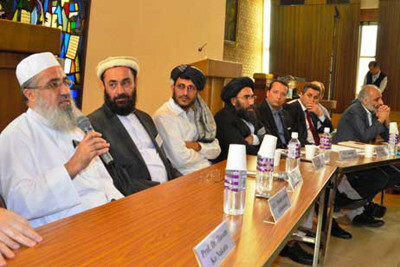 Dr. Ahmad Mahjoor and Dr. Akbar Wardak residing in Paris, casually and shamelessly evaluated the conference as a ‘good opportunity for knowing the views of the Taliban and an important step towards peace’. Our people are neither blind, deaf and senseless by birth, nor so unwise as to not have still recognized the Taliban, these creations of the CIA and ISI, filled with deep bitterness from their adolescent days in the Madrassas, who minced our men and women in their five year stone-age rule, and were in a competition with the US in killing our innocent people in the past eleven calamitous years. What ‘peace’? Giving a share of power to the dirtiest murderers of our history by their American patrons will bring peace? If Ms. Farkhunda and Nilofar are illiterate, understanding a simple matter that when these religious killers committed such cruelty as enemies, they might become worse when united, should not be so difficult for you professors, provided CIA had not been the source and inspiration of your political views. You, and others like you with big academic titles, know the truth and deny it, therefore you are criminals, educated traitors who act as the fifth pillar of the US in Afghanistan, and call upon our people to obey the US and its religious and non-religious hooligans. You are counting the days to when you will get a position in the future so-called government at the cost of your conscience and dignity, like other menial intellectuals namely Dr. Azam Dadfar, Dr. Rangin Spanta, Dr. Islamil Qasimyar and others. This is the real reason why you are euphoric (just like the workers of Radio Azadi, Wahid Muzhdas and Ahmad Sayeedis) at the event of negotiations between CIA-created terrorist gangs and agents of Iran and Pakistan. The US, which wants the world to know that it is responsible for the establishment of order in the world and nothing in the world changes without its will, can maybe extend its presence in the region by bringing together our enemies of different species and tightening their leashes in its hands, can create a regime much more mafia, dependent, corrupt, anti-people and ridiculous than the current one in our homeland. After the expiry date of its dirty creations, will take each by their tail and throw them aside like mice like it did with the Shah of Iran, Hosni Mubarak, Pinochet, Suharto, Zia Ul Haq, Noriega and its other lackeys. Surely a day will come when the US government will become weak due its fatal financial crisis and the justice-seeking movement of its people and the mass uprisings in different parts of the world, or will face a downfall and the pained people of Afghanistan, will drive away the US occupiers in an ultimate uprising, just like the brave people of Vietnam who drove away the occupiers half-dangling from helicopters, and will prosecute and punish the fundamentalists and other indigenous elements. Our people have a tough path filled with hindrances in front of them. But history has proved to us time and again, that the superpower US and its filthy creations of different religious and non-religious kinds are no more than paper tigers in the face of the will of a fearless nation who rise against them with a revolutionary leadership. This is not just a slogan. If the former Soviet Union suffered a bitter defeat on our soil, so can the US. Let there be hundreds conferences, Paris or otherwise, our people will not forgive and forget the traitors and criminals of the past three decades. Our people do not want the US bases, or a single government composed of Jehadi, Talib and Gulbuddini murderers, and their Parchami and Khalqi cowards. Our people want an independent and democratic Afghanistan, free from the fetters of fundamentalism. (1) Only showing affection for Captain Ismail, the VAVAKI and one of the most cruel bloodthirsty warlords, and the appointment of countless presidential advisors from among the Jehadi criminals and their even more traitorous and filthy sons, is enough for our nation to see Karzai worthy of the most severe punishment. (2) One of the duties of Radio Azadi is to quickly make prominent, specific people who the CIA has recognized and chosen to perform certain responsibilities. The voices of Farkhunda and Nilofar have also been heard in this radio for the past few months as ‘experts’. What deep lines separate Malalai Joya from the women of the regime: she gets the honor of being suspended from the assembly of Qanounis, Sayyafs, Rabbanis, Abdullahs, Alamses, Mohaqiqs, Farids, Payinda Mohammads, and others, and the latter get official posts and Dollars in exchange for sitting silent and shamefully compromising with the US and its dogs in the parliament. Similarly, when the US sees it necessary, it ties the tails of the Taliban and Gulbuddin to power, and by walking them from under a rainbow, makes them doves of peace, legitimizes them, gives them credibility and a political identity, and apparently makes them qualified enough to take part in the Paris Conference. Then again it orders its Radio Azadi to talk of a ‘soft stance’, ‘change’, and a ‘rift’ between the ‘moderate and extremist’ Taliban, from its mercenary and spineless intellectuals like Wahid Muzhda who asks for a ‘neutral and peaceful region’ with absurd rascality for the accommodation of his Talib and Gulbuddini masters. Most loathsome are the websites and publications that don’t feel any shame in publishing the writings of this filthy Gulbuddini-Talib ‘analyst’.